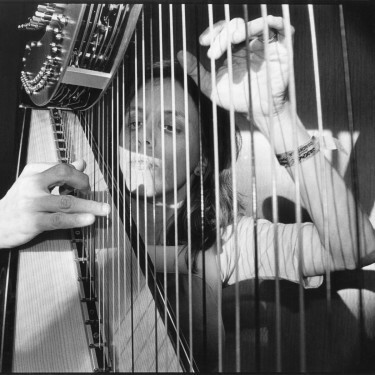 Zeena Parkins is a composer and improviser: a pioneer of contemporary harp practice and performance who reimagines the instrument as a “sound machine of limitless capacity.” She has extended the language of both acoustic harp and an evolution of her original electric ones, through the inventive use of expanded playing techniques, objects, and custom designed electronic processing. Her work draws on a relationship to dance, film, feminism, assemblage, architecture, urbanism, lists, textiles and detritus. In a circuitous path her processes employ sound travel and transformation, tracings, expanded forms of scoring, historical and technical research. She challenges and embraces contradictions and perceived boundaries through a morphing of real and illusionary instruments, the use of multi-speaker audio installations and other extra-musical considerations. Within a shifting constellation of Improvised/Composed/ Space/Sound/Noise/Music, Parkins remains in proximity to our body’s social dialogue with the insides and outsides of listening, with sound’s physicality, and music as material and matter, engaged in the ongoing translations of sonic states within a multitude of environments both expected and surprising. Commissions include: DAAD, Either/Or Ensemble, Ensemble Son, NeXtWorks Ensemble, Roulette Intermedium, Eclipse Quartet, William Winant, Bang on a Can, The Whitney Museum, The Tate Modern, Sharjah Art Foundation, Merce Cunningham Dance Company, Montalvo Arts Center, The Donaueschinger Musiktage and Sudwestrundfunk; Supported by Meet the Composer Commission, NYSCA Composer Commission, MAP Fund, American Music Center, Mary Flagler Cary Charitable Trust, Arts International. She has performed/recorded with: Bjork, Ikue Mori, Fred Frith, John Zorn, Butch Morris, Elliott Sharp, Tony Buck, William Winant, Magda Mayas, Rova Sax Quartet, Maja Ratkje, Hild Sofie Tafjord, Brian Chase, Jim Black, Nate Wooley, Bobby Previte, Chris Cutler, Mark Stewart, Nels Cline, Mick Barr, James Fei, Okkyung Lee, Matmos, Pauline Oliveros, Yoko Ono, Christian Marclay, Kim Gordon, Lee Renaldo, Thurston Moore, Yasunao Tone and So Percussion. A partial list of her awards include: Doris Duke Artist Award, Three NY Dance and Performance Awards (Bessies), DAAD Artist Fellowship, Shifting Fellowship, Foundation for Contemporary Arts, NYFA Music Fellowship, MAP Fund, Peter S. Reed Fellowship, Prix Ars Electronica Honorary Mention. Residencies include: Herb Alpert/Ucross, Rauschenberg Residency, DAAD/Berlin, Civitella Ranieri, Oxford University/Ruskin School, Harvestworks/NYC, Steim/Amsterdam, and Montalvo/California. Ms. Parkins has been a lecturer at Oxford and Princeton Universities and has taught at the School of the Museum of Fine Arts in Boston and Bard College. Currently, she is a Distinguished Visiting Professor at Mills College.